A lot of us dream of being involved in the gaming industry in one way or another, whether it be developer, media, programmer, or artist. While a lot of focus has been on smaller developers on the PC space, there are successes in the board game industry as well. 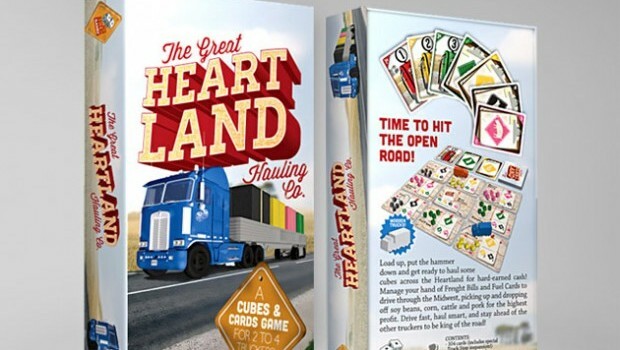 The Great Heartland Hauling Co. is one of those successes, and I asked Jason Kotarski, the game’s designer, about his experience creating the game. What are some of your board game influences? I got into board games shortly after leaving my punk band. So as an adult when I was looking for a fun hobby that I could do at home on the weekends, board games showed up at the right time. My wife shared a Settlers of Catan with me and I was hooked. Ticket to Ride was next and is still one of my favorites. I guess the European-style games are the ones that first grabbed my attention. I loved that everyone played to the end and they weren’t really conflict based. When I really started diving into the hobby, stuff by Knizia was big for me, specifically Lost Cities and The Great Wall of China. I loved how much game could be packed into a deck of cards. I think those are some of the key influencers to my design; Euro-flavor and lots of game packed into small boxes. Is this the first game you have developed? Yes! The Great Heartland Hauling Co. is my first design. I thought it would be cool to design a game but didn’t think I could come up with anything original, then the idea hit me and I had this urge to get the game out in the world so I started looking for publishers and eventually, 3 years later, ended up with one of the best new companies in the business, Dice Hate Me Games. Since getting the game published the ideas keep flowing. There hasn’t been a time that I haven’t been working on a game since. [singlepic id=11877 w=320 h=240 float=right]Most games of this style seem to have themes involving the Mediterranean or Midieval times. How did you come up with the idea of using semi trucks? I used to work in shipping and receiving so I knew a little about trucking. I had a conversation with a trucker one day that sparked the idea and it took off from there. For me, a big part of the design process if starting with a theme and going from there. Once I have that starting point I have some boundaries that allow me the freedom to bounce ideas around within that framework. Also, I hadn’t seen a lot of trucking games so I figured it would standout a bit in the world of train games and fantasy. Did you use the cards to increase replayability, or were there other reasons for that? I initially settled on cards because I knew they would be more cost effective to produce. I tend to start with the end in mind when working on projects to in this case I knew I wanted to be able to have something tangible when I was finished without breaking the bank. With Print-on-Demand options like The Game Crafter and SuperiorPOD, I knew I could at least have a copy of my game for me and my friends. It just turned out that the way the game started coming together, with the board made up of cards, would make the game a different experience every time. Once I discovered that I just rolled with it. How long did it take to develop the game? In first started working on it in Spring of 2010 and really didn’t stop working on it and tweaking it until just before our Kickstarter closed in Fall of last year. The initial idea came quickly, my first prototype was ready after 24 hours but then the real work starts with play-testing, balancing, and more play-testing. [singlepic id=11878 w=320 h=240 float=left]Was it difficult to find a publisher for The Great Heartland Hauling Co.? That’s tough to say. I didn’t feel difficult for me, but that could be because of my personality. When I get an idea, I like to act on it so I keeping things moving until that idea comes to fruition. I got some rejection letters, mostly from publishers that had full release schedules. But then I signed the game with Cambridge Games Factory and got into the convention scene a little and started meeting lots of great people who were connected to the industry. The game got delayed a couple times with Cambridge so I requested to cancel my contract to start looking for a new publishing home. On the day I cancelled my contract, I got a call from Chris and Cherilyn from Dice Hate Me who I had met a few days earlier at Origins. They offered to publish the game. It was a very surreal experience. But I think the bottom line is that if you have an interesting game, a good game, you can get it published if you stick with it long enough. Being a game designer isn’t your first job. What does it feel like seeing your game out on store shelves? I actually just saw it on a store shelf for the first time last week. It was awesome. Aside from the a Kickstarter campaign going so well, it was one of the moments that made it feel real. I saw it on the shelf and it was reminded of how cool this whole process has been. Do you have any other game ideas brewing right now? I have several prototypes in the works as well as a new game I’m self-publishing through TheGameCrafter.com called FrogFlip. It’s a 12 card mini-game where you flip a disc, like a coin, towards a lily pad trying to capture some bugs for lunch. I also have a game coming out with White Goblin Games but it hasn’t been announced yet so I can’t say much about that. That one is planned for later the year. Other than that, I’m just planning to keep working on ideas as they come and see where this road takes me!